I’m travelling to Spain and France for two weeks in early May, flying off on 28 April, so during that two weeks it is highly likely that I will have close to zero access to internet. So to make up for that lost time, I’m trying to work more on my blog these days and posting more stuff for readers like you! 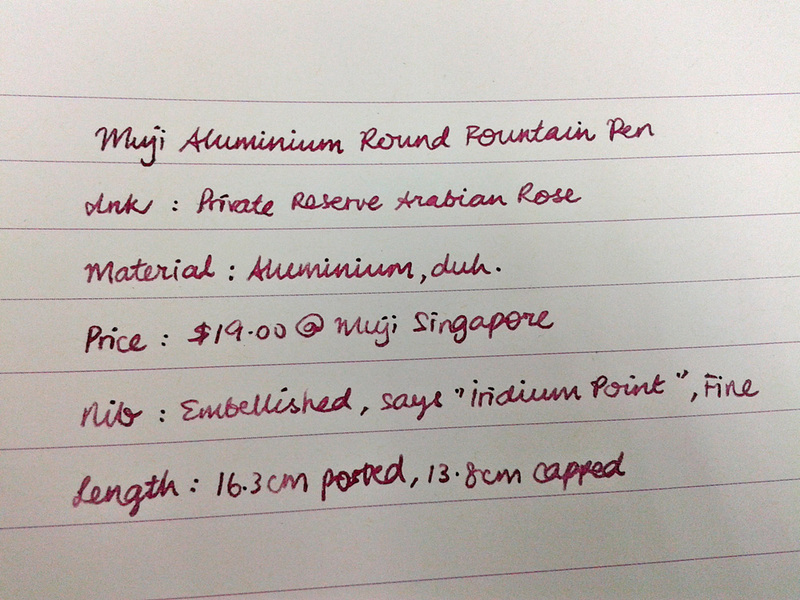 Today, I finally have another pen review on board: that of MUJI’S! Anyone around here likes Muji products? If this pen were a woman, she would have the worst figure of all women on Earth. Wait a minute, I don’t mean that in a bad way. It’s just, you know, I’ve always had pens which have at least SOME variation in diameter at some location of the pen (excluding the nib and feed section), but this pen is so incredibly CYLINDRICAL, that even when the cap is posted like in the above picture, the whole pen stays cylindrical (well, except for the clip of course). How, you might ask? If you look at the groove at the end of the barrel, that’s where the slim circumference of the cap fits snugly into. I am still ambivalent about this aspect, though. Pros: If you like the aesthetically-pleasing view bestowed by a perfectly cylindrical barrel of a Muji fountain pen, then it’s just great. If you love fixing puzzles and the like, then fitting the cap onto the groove could provide some sort of mini exciting satisfaction for you when you post the pen. Cons: If you are rushing to post your pen and take down notes, you might be irritated that you need to align it properly before it fits. If you have a tendency to twirl your pen while it’s posted, be careful! The cap is likely to fly out at some point and hit someone on the nose or in the eye. By the way, the capping function works the same way as the posting function – you need to cap it at a specific location too. I’ve had this pen for many months, probably a year now, and it was one of my first few fountain pens that I bought. I have never used it heavily before, but then again I never used any of my pens heavily before either. This pen comes priced at about $19 with a black ink cartridge and packed in a resealable plastic bag with instructions on how to fit the cartridge onto the pen. In Japanese. Typical of Muji. You can’t always find this pen at the store, though. It’s like the Platinum Preppy at Kinokuniya, you gotta be lucky to be able to find it. Just keep trying, and check out the other Muji stationery stuff if you can’t find the fountain pen. Don’t confuse it with another pen in a similar packaging, which actually isn’t a fountain pen! Pretty engravings on the nib! The size of the nib that I bought is a Fine, and you can see the letter “F” engraved in the centre. It says below “Iridium Point”. I like the design of the nib section as it looks really classy, but I was hoping it would at least bear the mark of Muji on it. That said, there is absolutely no mark on any part of the pen indicating it belonged to Muji. If this nib size were a medium, I would probably have mistaken the “M” that would be engraved in the place of the “F” as the “Muji Mark”. Whoops. The nib writes pretty well, with the usual skips I encounter since I’m writing left-handed, but nothing serious. I thought this would be considered a smooth nib at my first time of writing, but over time as I rotated to other pens, I came back to this finding that it’s not as smooth as I had thought. However, my right-handed friend who also got this pen is totally in love with it, and touted it “one of her best pens ever possessed”. According to her, the writing is tactile-smooth and ink flow was decent. I’m secretly jealous that I don’t perceive it the way she does. Being made of aluminium, it does have its merits. Firstly, it’s super lightweight. 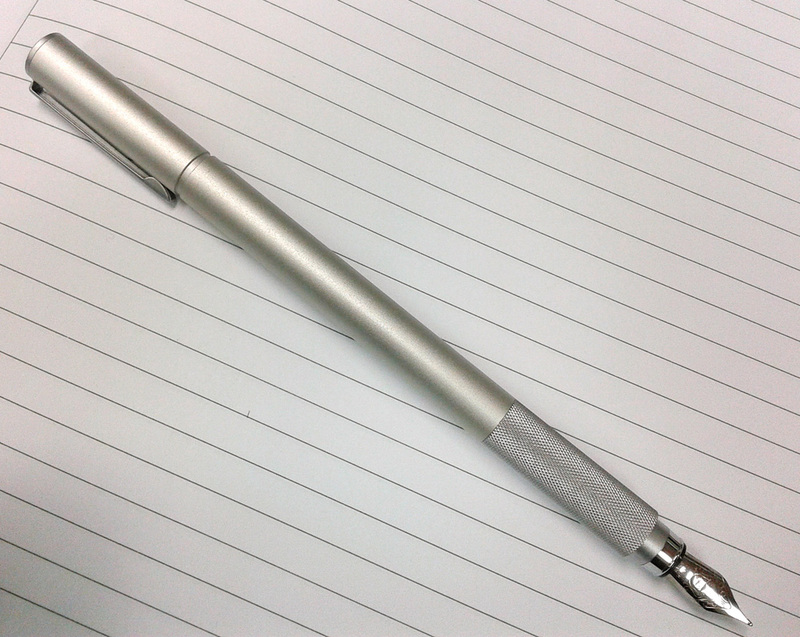 Secondly, the pen seems to be perpetually cool – in terms of body temperature. Every time I pick up this pen it feels like it has just arrived from a mildly air-conditioned shopping centre. The pen is also slim and would be great for people with small hands. I have already used up the black ink from the cartridge that comes along with it (oh yes, almost forgot to mention that this pen takes international cartridges), and I’ve just filled the cartridge out with Private Reserve’s Arabian Rose ink! The picture below is not an accurate showcase of the pretty colour of the Arabian Rose, but I am not advanced when it comes to photography (in terms of both equipment and skills), so we’ll have to make do for the moment, sorry! My super small cursive handwriting. The first “M” is only 3mm in height! One more thing to take note: when using the black ink for this Muji, the nib was often fogged-over by condensation, as if I had just taken a few deep puffs onto the nib section to clean it and attempt to look at my pretty reflection in it like a mirror. I associate this phenomenon with the ink in the previous statement because after changing to the Arabian Rose, I never encountered such a problem anymore. This is a mystery I have never managed to solve – anyone encounters this problem on their fountain pen nibs too? If you ask my opinion, I’d say, just get this pen. 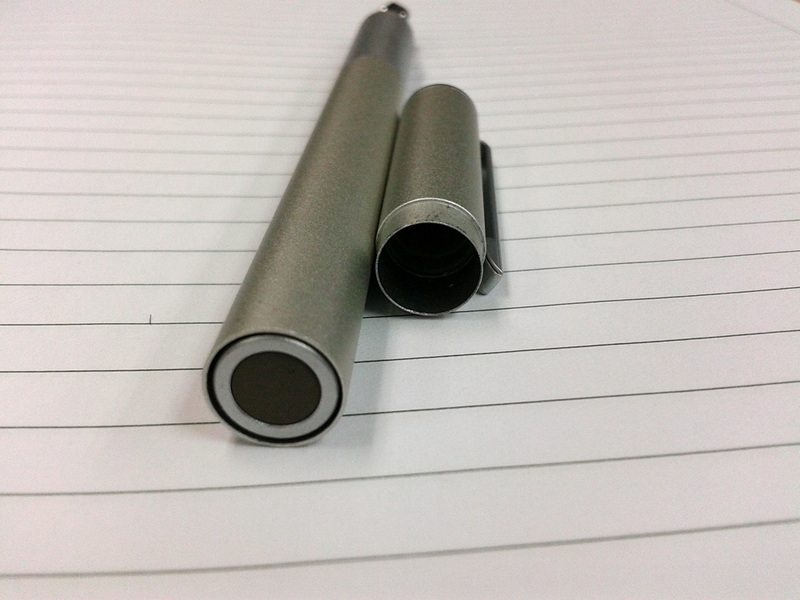 It’s not expensive, it looks almost minimalistic and futuristic (if you like minimalistic and futuristic-looking pens), it has a nice nib design, and it’s light and small to carry around! Also an interesting pen for those of you who like the design of the Macbook Pros. 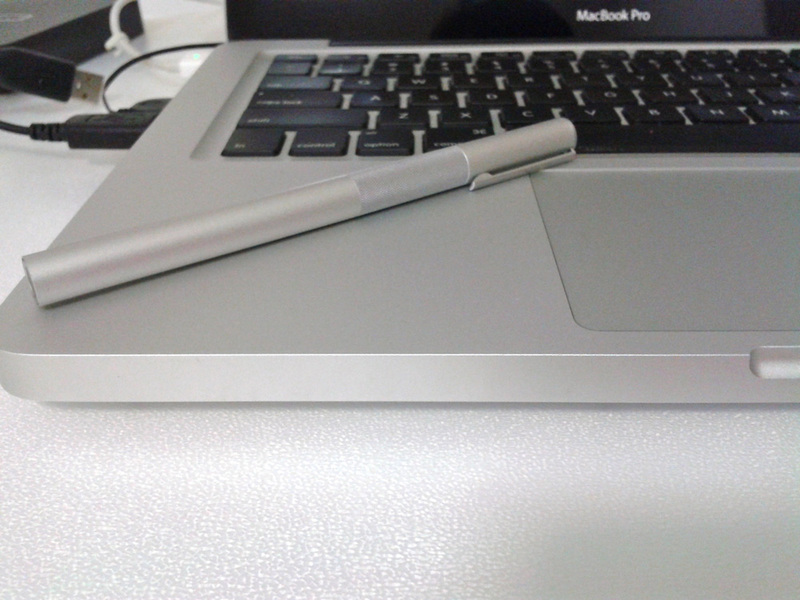 If you have a Macbook Pro, you can get a Muji pen to match and camouflage. Thanks for pointing out the ‘F’ engraved onto the nib. 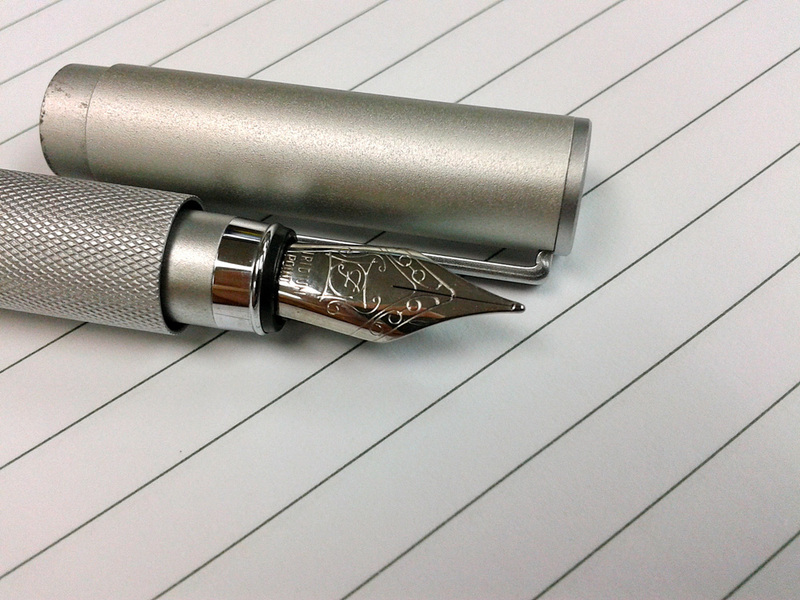 It’s actually a Schmidt nib (a Germany company) for both the compact and full sized Muji Fountain Pen. I recently got the pocket version of this pen, and I’m quite enjoying it so far, using it for about a week. When I first installed the ink cartridge, I was quite retarded and did not click in the cartridge into the pen, I only clicked in the ball inside the cartridge and assumed that was all I had to do, which was a mistake as I found out the next day when it was seeping ink out of crevices in the pen, thankfully nothing got stained. I cleaned it best as I could using tissues and now I’m trying to open the pen up and it’s all seized up, can’t get it to open at all. Even tried pliers which only left ugly scratches on the pen body. What should I do now? Sorry! I thought there were internet connection problems and that my comment didn't go through. I refreshed the site and it didn't show. Hehe. Sorry about that. Sending you an e-mail right now. Thanks! Hello Ralph, I saw that you left three comments on my blog. Lol. Deleted the other two since they are about the same thing. Sorry I haven't been diligent on my blog since getting my new job as I am pretty occupied. Anyway, thanks for your comments! Most international short cartridges should work on the muji pen. That is to say, the Parker one probably will be too big for it. Check out cartridges from J. Herbin, Pelikan or Waterman. Where do you live? Drop me an email so I can see if there are any nearby places where you can get those cartridges. Hi! I'm new to owning a fountain pen and I was wondering what the ink cartridge alternatives were for the Muji pen. They stopped restocking the ink cartridge in my area and my personal stock is running low. I was wondering if a Parker refill or whatnot will fit? Can you please try the Muji gel pens? Thanks!